Cross Number Puzzles: What is a Crossnumber Puzzle? A crossnumber puzzle (also known as crossfigure, figure logic, or numberlock puzzle) looks like a crossword puzzle, but has numbers instead of words in a grid. 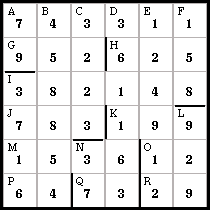 The crossnumber solver can find all possibilities of filling the grid with numbers in a way that all statements about these numbers are true. Many number puzzles that do not look like a crossnumber puzzle at first glance can be formulated as crossnumber puzzles and therefore be solved by the crossfigure solver. Because in a crossnumber puzzle, we are not looking for words, consisting of letters, but for numbers, the positions of those unknown numbers are marked with letters. No zero occurs in this crossnumber puzzle. A "Palindrome" is a number that does not change if its digits are reversed, e. g. 525. The solution can be found by either evaluating the following statements and thinking hard or by using the crossnumber solver. G If J across is subtracted from this number, the result is a square number. K The sum of this odd number's digits is a prime number.